If data presentation at a PC and also data storage and retrieval is required, the software of Observator may fit this job. The software allows you to collect data from all your monitoring sites into a single data base. Several organizations use our software to monitor the data from all meteorological and hydrological measurement stations. Companies involved in marine engineering, off-shore or dredging use the software to combine all their environmental measurements (including water quality, waves, wind) into a single overview. Data ranging from raw data to the most sophisticated reports and graphical representations (tables, graphs and reports) can be viewed and downloaded by all users who have the right to access. In addition to directly viewing the data in a single overview, it is also possible to perform calculations on the data, test for (complex) alarm conditions and so on. 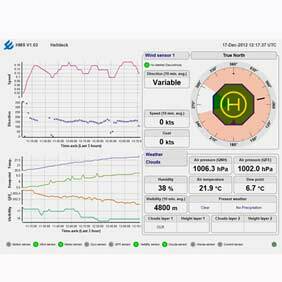 You can directly control and analyze the measurement data. You can look at your measurement data whenever you want, wherever you are.